Each fall the amazing Monarch Butterfly migrates 2,000+ miles from the Northeast United States to Mexico, passing through North Georgia in September and early October. They usually travel at treetop level along mountain ridges, so they may be harder to spot in lower elevations. Their wings feature an easily recognizable black, orange, and white pattern. The Monarch is the only butterfly in North America to fly south in the fall and perform a return migration in the spring. The Monarchs that winter in Mexico start their journey back in the spring but die along the way. So their descendants finish the trip to northern breeding grounds where they lay their eggs on young milkweed plants. The Monarchs that fly through our North Georgia Mountains probably came from eggs that were laid in milkweed meadows in Pennsylvania, New York, Ohio and Canada. They start their migration in mid-August and travel about seven miles per hour. The best viewing time is after a cold front has moved through and the wind is blowing from the north, pushing the butterflies along at a quicker speed. About 20 years ago, an estimated one billion monarchs made this migration. 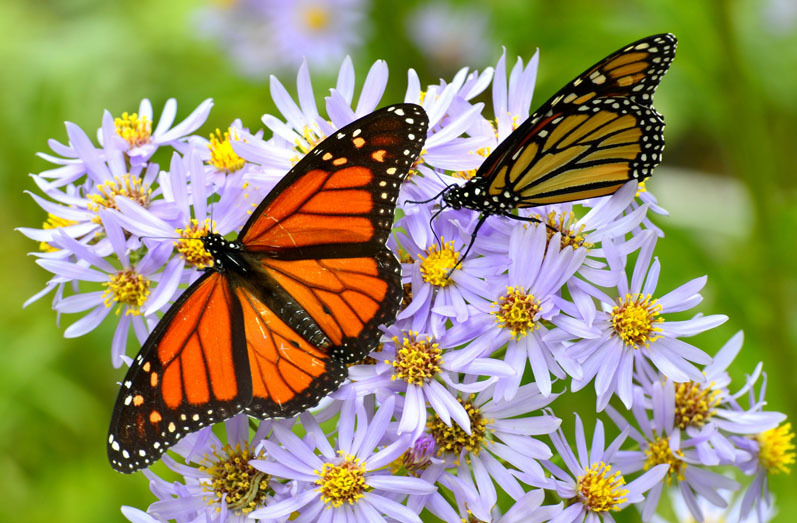 In 2015, only 150 million monarchs made the trek. This dramatic decrease is due to the butterflies’ loss of habitat and food sources, including the milkweed plant (also called butterfly bush). Unlike some species of butterflies, Monarchs have only one larval plant, so they depend on milkweed for survival. Unfortunately, the milkweed plant is frequently mowed down when housing or commercial development projects are begun. Female monarchs lay their eggs on the underside of poisonous milkweed leaves. As the caterpillar hatches, it eats its own egg and enjoys a diet of milkweed leaves. The milkweeds’ toxins remain permanently in the monarch’s system, even after the caterpillar metamorphoses into a butterfly. Animals that eat a monarch become very sick and, therefore avoid them. Most monarchs will live only a few weeks, but the generation that emerges in late summer and early fall is different. These butterflies are born to travel and may live for eight or nine months to accomplish their lengthy migration. Beechwood Inn gardeners have transplanted a large number wild asters, goldenrod and milkweed (some of their favorite plants) to Beechwood Inn’s grounds, making it a great location to view these beauties as they make their long journey to Mexico.